My husband is a manager in the corporate real estate profession. If you were to ask him how difficult it is to get a building project started, he would definitely tell you that it is not the easiest thing to accomplish. There are a lot of factors involved, like what country are you going to build it; what are the legal laws of the land; how much money is needed; who would be involved; how obstacles should be handled, and the timeline for completion. Nehemiah faced similar obstacles as he attempted to fulfill his spiritual calling to rebuild the wall around Jerusalem. 5. Surround yourself with the best talent possible. 6. Be humble and acknowledge that God is your strength. The book of Nehemiah and the book of Ezra are thought to have originally been one book. It is obvious that Ezra, the priest and scribe, and Nehemiah were colleagues. After the completion of the wall, the people needed some reconstruction of their own. We find Ezra and other Israelites gathering by the Water Gate worshiping, reading the Law, teaching the people to acknowledge the Lord, and encouraging them to study and understand the words of divine instruction. Then, on this HOLY DAY, we see Nehemiah, Ezra, and the Levites rejoicing. If you are in a ministry role, after a big project (like Vacation Bible School), the workers need to regroup and be encouraged again to stay working for the Lord and seeking again to please Him as they move forward. If in the ministry, do you encourage your employees (or volunteers) to humbly worship, read the Bible, encourage them to study God’s Word, and reiterate that God is their strength? If in a job situation, when a remarkable job is completed, do you just let their “high” accomplishments go or do you praise them and encourage them to continue on with their good work? The letdown after a big project can loom for a long time, but as leaders, we can prevent that with a little time spent afterwards looking forward to the next project, the next ministry, or next learning opportunity. 7. Correct and admonish when needed. The time will come when someone who works for you needs correction and admonishment. It is a tough and sensitive issue that leaders face. Nehemiah was able to lessen the load by pre-handling this by giving his men an example from the past explaining what Moses said to the people who rebelled and were disobedient. What better way than to pre-warn people of consequences that might come when correction, admonishment or even firing needs to occur by talking about it beforehand. How wise. 8. Obey the company or ministry policies. Companies, churches, organizations, and families have policies and/or rules of ethics. They are there to be abided by unless, of course, they are against God’s laws; in that case, decisions and prayful considerations need to be made on a course of action. If your ministry (individual or group) does not have policies, it may be time to develop them. Many ministries have or are developing boards or foundations to oversee their own activities to be sure they are operating under an authoritative source. 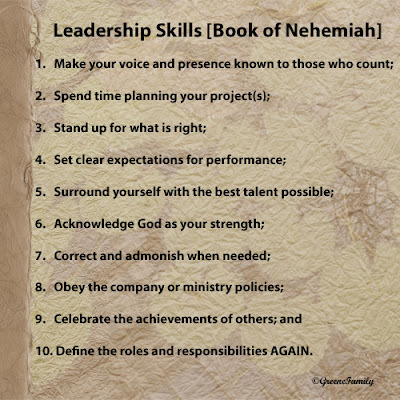 In Nehemiah 10, the purpose was to join and bind the people together with an oath to follow God’s laws, commands, regulations, and decrees. Regulations and codes of behavior are very important in both corporate offices, ministries, and even within homes, especially where children are growing up under the instructions of their parents. “The rest of the people—priests, Levites, gatekeepers, musicians, temple servants and all who separated themselves from the neighboring peoples for the sake of the Law of God, together with their wives and all their sons and daughters who are able to understand— all these now join their fellow Israelites the nobles, and bind themselves with a curse and an oath to follow the Law of God given through Moses the servant of God and to obey carefully all the commands, regulations and decrees of the Lord our Lord. Nehemiah celebrated the dedication of the wall with gladness. In both businesses and churches, we see achievement awards, 10-year anniversary recognitions, and “Good Job” certificates. All these play an important place among those who have worked alongside of you to achieve the goals the Lord has given you. You may not even be aware that those who are working for you are inwardly proud of their own personal accomplishments through “your” project. If you close a deal at work, how about a party to acknowledge the good and steadfast work of your employees? How about throwing a dinner to thank those who volunteer their time and effort in the ministry? And, what’s wrong with some ice-cream for good grades? 10. Define roles and responsibilities AGAIN. And finally, in Nehemiah 13, we see that Nehemiah had left Jerusalem during the 32rd year of King Artaxerxes. But, when he returned, he found the house of God in disarray. Widespread shenanigans were going on in his absence. Upon arrival in Jerusalem, Nehemiah proceeded to command that the chambers be cleaned. He contended with the officials and asked them why the house of the Lord had been neglected and forsaken. He reproved the nobles and warned them. He cleansed them from everything heathen and he started all over again with defining roles and responsibilities [Nehemiah 7:65] In ministry and work, redefining roles and responsibilities, is not a one-time thing. It must be continually taught. Just as in our lives, we must continually be in the Word of God and hear God’s expectations continually. It isn’t just going to church on Sundays. It isn’t just going to a conference. It isn’t praying only in our time of need. 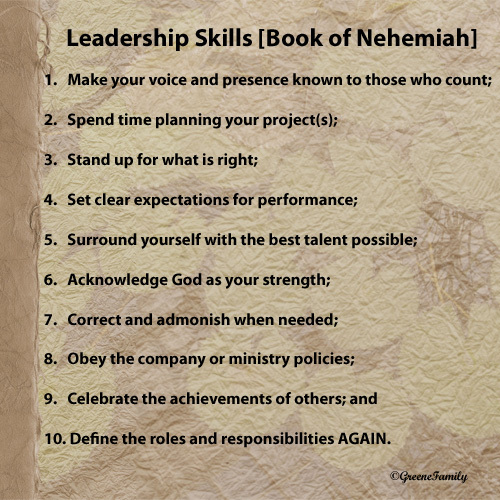 Our bosses or ministers will not always be around to instruct us as was the case with Nehemiah. When he wasn’t there, the people turned into ungodly activities. We, as individuals, must remember that is our duty to continually be in contact with the Lord. We can’t live in someone else’s shadow. And, as a leader, we need to constantly remind those working alongside of us to be responsible and obedient with or without "the leader or boss" around. This chapter reminds me of the idiom, “When the cat’s away, the mice will play.” Let’s be responsible ourselves and teach those who are under our leadership to always act like the CAT’s around! In conclusion, let’s celebrate Nehemiah’s contributions. His administrative skills were outstanding. He completed the work God assigned to Him. He faced obstacles honorably. He acknowledged his strength came from the Lord. If only he were here, I’d throw him a party of grain, legumes, and domesticated beasts to celebrate the legacy he left behind to the family of God!!! Oh mighty God, thank you for the leadership roles you have placed me in. Let me be an example to others through your strength. Give me wisdom and humility so I can lead as you want me to. Let me rejoice at the achievements of others. In YOU alone I trust.